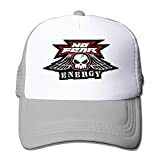 No Fear Energy Drinks originally were a line of energy drinks produced by Sobe/ Pepsi, but since have dropped the Sobe name and are now simply No Fear. They are now available in the UK as well. In addition to the Original pictured, they have Citrus, Cherry Lime, Sugar Free, and in the UK it's called No Fear Extreme Energy. 16 Pack - Spider Widow Maker Energy Drink - Sugar Free - 16oz. Here we review two flavors of No Fear Energy Drink, Motherload and Bloodshot. Pepsi must have decided the Sobe label wasn't helping them sell energy drinks as the new cans are missing that moniker altogether. No Fear is the only branding on the new design and I can't say I took that advise to heart. I felt a twinge of fear as I took the can to the counter. I wondered if I was about to spend my $2.25 on 16oz of foul-tasting brine or if it would surprise me by being tasty and potent. I can't help but have these thoughts because this is a can of No Fear Motherload and it shares a likeness in color and name with Full Throttle Mother, the second most disgusting energy drink of all time*. I admit I flinched a little when I opened this drink. I hesitated before taking that first exploratory sip. Anyone who has tasted a Full Throttle Mother (aside from the couple people who actually liked it) would have a perfect reason to be wary. This, however, is a horse of a different color. I was pleasantly surprised by the sweet, citrusy taste and went back for a bigger gulp. And that's when the aftertaste hit me. Now I haven't fully made the correlation between this kind of aftertaste and presence of dragonfruit. It could be something entirely different that makes it taste like this. I've been told the B vitamins might cause this kind dull, base aftertaste. What I do know is that it shares this taste with the dragonfruit drinks I've had in the past and it's not good. If you are a fan of Vitamin Energy's dragon fruit flavor, you'll like this as well. It's just not my thing. Motherload advertises itself as the "Vitamin Mega-Load." Looking at the label you'll be getting 600% of the recommended daily value of vitamins C, B6, and B12. 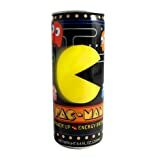 Add that to 182mg of caffeine, 2000mg of taurine, and some of the other usual suspects, giving you an impressive blend. I wasn't disappointed with the energy boost I got from the Motherload. It came on clean and strong with no jitters and kept on going through the working day. There was also no noticeable crash. In terms of energy content I'd say this is almost a perfect blend. Too much more caffeine and you get clenched and jittery, any less and the drink has no power. The vitamin content should make it an effective hangover remedy as well. I want to like Motherload. It's heart is in the right place. The formula is spot on, but the aftertaste is going to keep me away from this. It's bearable at first, but toward the end it's a struggle for me to take another swig. That being said, I'd recommend you try this anyway. Depending on your tastes, this could be a really great drink. To anyone shying away thinking it's a Mother clone; have No Fear. *I promise I will review the first most disgusting energy drink of all time soon. No Fear Bloodshot is the newest drink from Pepsi since drop-kicking the Sobe label from the can. Several weeks ago I test drove the Motherload blend with mixed results. Being that I'm always excited to see a new orange flavor hit the shelves, I had much higher hopes this time around. I hesitated as I opened Bloodshot when I saw it was made with dragonfruit juice. I've never had good luck with dragonfruit drinks, though I have no way of knowing whether it's a characteristic of the fruit itself or if I've just found bad drinks. The first sip obliterated my concerns as Bloodshot has a light tangerine/orange flavor and lacks any of the bitterness traits that I usually associate with dragonfruit. There is no perceivable aftertaste. The light carbonation combined with the citrus flavors and real juice contents was an absolute pleasure to drink. This is quite easily the best tasting No Fear drink available. There is nothing out of the ordinary in the Bloodshot blend. Along with mega-doses of B and C vitamins, there is the usual Taurine, L-Carnatine, Gurana, and Panax Ginseng. There is 87mg of caffeine per 8oz serving. I probably drank my Bloodshot at the wrong time. I was physically exhausted, it was late in the evening, and I don't know that any drink would've pulled me out of the slide into comatose sleep. Usually I'd give a drink a couple go's before passing judgment, but due to the rarity of this flavor in my local area, I could only get my hands on one. That being said I'm going to give Bloodshot a pass. Based on it's contents, it should perform no worse than other members of the No Fear family. If Bloodshot were more available to me, I would definitely drink more of it. It tastes great and I'm sure under normal circumstances it would kick just fine. Based on taste alone, it's one of the best juice energy drinks I've ever had. It easily surpasses the Monster and Rockstar juice flavors and would compete with any regular citrus drink as well. I'll be keeping my eye out and hoping this drink makes it into wider distribution in my area. It's that good. How Does No Fear Energy Drink Compare? No Fear Energy Drink contains 11.38 mgs of caffeine per fluid ounce (38.46mg/100 ml).